In middle 2001, Verant added a new zone. The zone was called The Warrens and in it ran a river. 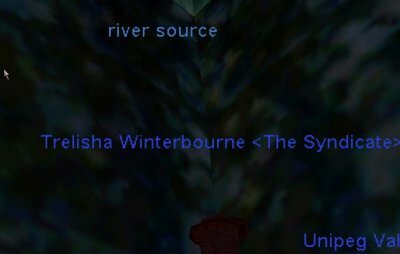 At the mouth of the river was an invisible mob called River Source. Strange name or a mob and there was some speculation on what it was and what it did. A GM was talked to who mentioned the mob had never been killed before on any server. Thinking the challenge of a new mob might be fun, The Syndicate set out to tackle it. Bear in mind this is a midlevel zone so the thought was it would be a quick, easy kill and we'd see what it dropped and learn more about it. That was not the case. Although the mob is a midlevel one and doesnt hit hard, it is definitely not a quick kill. This mob appears to have more HP than any other mob in game. It had anywhere from 1,000,000 HP to upwards of 5,000,000 HP. A constant beating for hours on end is what it took for this mob to die. Thousands of HP damage per minute and yet it still took hours to die. Movement of the health bar was imperceptible except over time. Exact HP numbers were difficult to judge over that length of time of constant attacking. Oddly, when it died it left no corpse and a new one spanwed nearly instantly. It is unlike Verant to add a mob that serves no purpose. There must be some purpose for this strange mob with a million or more HP. Its rumored to be something for an Erudite SK quest. Certainly killing it offered nothing of value except the knowledge that we killed the mob with the most HP on the server that no one else had ever killed before.